A few weeks ago we looked through Donald Taylor’s The L&D Global Sentiment Survey. This reports the previous years’ attempts by the L&D community to predict hot topics in L&D for the upcoming year. Fresh results: Twitter trends in 2017/Q1 are available here. “What will be hot in workplace L&D in 20XX?” is his single survey question. Definitely straightforward! It does, however, leave some room for interpretation. Our question: do the results really show what is likely to be implemented and/or popular in 20XX? Or, do they rather reveal what L&D professionals in late 20WW were keen to talk about or wanted to believe in? While fortunetelling is always an iffy proposition, we wondered if we could somehow compare the results of Taylor’s previous research (the ‘what’s going to be hot’ survey has been running since 2014) against any other data. A few pints later, we had a plan. We decided to analyze L&D-related Twitter posts from 2016 to identify topics people were actually talking about, as a comparison to Taylor’s 2016 predictions. It took us several days to get the first data, and a couple more weeks to polish our research methodology and finalize the results. While our results don’t completely give us the answer to either our, or Taylor’s questions, they most certainly put the survey predictions for 2016 into perspective. 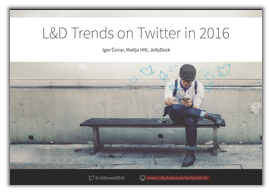 Our Twitter 2016 analysis helped us to better understand L&D’s present, and (we think), it’s near future. Virtual Reality and Augmented Reality were the absolute winners on Twitter. More importantly, the interest for this topic was insignificant in the beginning of the year, but rose month by month. Geographical analysis shows it was extremely popular in the US. Nearly 70% of all 2016 L&D-related tweets were technology related. However, survey results gave importance to other topics and approaches. It’s probably safe to assume that L&D professionals trend ‘liberal’ when on Twitter while holding onto realistic or even conservative opinions in real life (or industry-specific surveys). L&D oriented topics (e.g. knowledge management, personal knowledge mastery…) did not make their way onto Twitter (or could not be effectively caught in our analysis). Previous post: Compliance Testing: A Basket Case?